Known as the king of the dinosaurs and a vicious meat eating carnivore, the Tyrannosaurus Rex roamed the Earth 67 to 66.5 million years ago. The fascination in this king of the beasts most certainly comes from the fact that this terrifying creature was once alive, alive and kicking around all 7.5 tons of its weight around the land that we now call our home. From fossil discoveries paleontologists can tell a lot about how the Tyrannosaurus Rex used to live, including the animals that it used to feel upon. By analyzing fossils that are millions of years old paleontologists can find, with a remarkable amount of detail, many unusual facts about this terrible lizard. Against popular belief the Tyrannosaurus Rex did not walk the Earth during the Jurassic period; this massive king of the dinosaurs actually roamed the Earth towards the end of all dinosaurs – during the late cretaceous period. The Tyrannosaurus Rex was, in fact, one of the last non-aviary dinosaurs to roam prior to the great extinction event at the end of the late Cretaceous period. During this time the earth was swollen with a wide array of species of dinosaurs and increasing diversity among those that made it through the Jurassic period in to the Cretaceous period. While the Earth was indeed teaming with dinosaur life the North American continent was being taken by storm by one of the largest and most vicious bipedal carnivores – the Tyrannosaurus Rex. In fact the Tyrannosaurus Rex is the largest of the Tyrannosaurids. While smaller Tyrannosaurs walked Asia, nothing compared to the Tyrannosaurus Rex who measured up to 42 feet in length and stood up to 13 feet tall at the hips. While the Cretaceous period brought some much larger carnivores to the scene something about the humongous Tyrannosaurus Rex makes it stand above the rest. The Tyrannosaurus is a type genus of the family Tyrannosauroidae and is recognized by its size and shape. Namely the Tyrannosaurus Rex was a bipedal carnivore that had two huge, powerful hind legs to carry its massive torso. The Tyrannosaurus Rex also possessed a particularly large skull which had to be balanced out by the large thick tail to maintain the balance of such a large beast. The Tyrannosaurus Rex also had two fairly small arms which although small were extremely powerful and each possessed two clawed fingers. The function of the smaller forelimbs has been a question of debate sparking such solutions as assisting the Tyrannosaurus Rex in rising from a prone position, grasping a mate during copulation and holding struggling prey while it was being eaten. Grasping solutions are widely accepted as biomechanical analysis has shown that the forelimbs were designed to withstand extremely heavy loads of up to 439lbs alone! The Tyrannosaurus Rex was covered in mosaic scales and while it is argued by some paleontologists that they may have had protofeathers like some other Tyrannosaurids, this has yet to be proven in the Tyrannosaurus Rex. It is unlikely that the Tyrannosaurus Rex possessed such protofeathers due to the fact that they were not useful for large mammals in warm climates. The extra insulation from protofeathers would trap excess heat against the Tyrannosaurus Rex skin and in the warm, rainforest type climate of North America such increased insulation could prove deadly. The eating habits of the Tyrannosaurus Rex are a subject of much debate among paleontologists, there are those who believe that the Tyrannosaurus Rex was an active hunter and then there are those who believe that the Tyrannosaurus Rex was a scavenger. The ability of the Tyrannosaurus Rex to move is perhaps the key to determining how this mammoth dinosaur actually fed. Being such a large dinosaur with a long protruding tail the Tyrannosaurus Rex would not have been able to turn as efficiently as its smaller counterparts and it is estimated that it’s turning speed fell somewhere between 11-25 mph. How Fast Can Tyrannosaurus Rex Run? To help make such estimations of the locomotion of the Tyrannosaurus Rex paleontologists rely on footprints and tracks. It is from the evidence of Tyrannosaurus Rex tracks that paleontologists can make the assumption that these huge beasts did not in fact run, at least not with any speed. There are many scientific discussions based around the physical composition of the Tyrannosaurus Rex and its impediment in such a large beast running successfully. Take for instance what would happen were a 7.5 ton dinosaur to trip and fall while running. A 2007 study determined that the Tyrannosaurus Rex probably hit a top running speed of 18mph. While this may seem slow for a predator, the fact remains that this is faster than many of the smaller dinosaurs on which the Tyrannosaurus Rex preyed. T-Rex: Both Scavenger and Hunter? The bone crushing ability of Tyrannosaurus Rex teeth point to a need to consume less nutrient rich parts of a carcass. Healed Tyrannosaurus Rex bite marks in other dinosaur fossils which point towards assaulting living prey. As it stands currently experts fall mostly in the middle asserting that the Tyrannosaurus Rex was both a scavenger and a hunter. How Old (Long) Did Tyrannosaurus Rex Live? It is unsure as to what age the Tyrannosaurus Rex was capable of living to but the oldest known specimen (known as “Sue”) is approximated to be 28 years old upon her death. Upon analysis of a variety of Tyrannosaurus Rex specimens, however, a pattern has been discovered whereby Tyrannosaurus Rex individuals die within six years of reaching sexual maturity. A similar pattern can be seen within mammals and large birds of modern day society. As more samples of Tyrannosaurus Rex have been discovered paleontologists have been able to distinguish two varieties of body build, a more robust specimen which proves to be female and the more gracile specimen being the male. It is believed that the robustness of the female is a function of passing eggs. Theories on sexual dimorphism in Tyrannosaurus Rex, however, are argued due to the fact that only one Tyrannosaurus Rex specimen has been conclusively determined as female after soft tissues were sampled and determined to be distinctly female. Where and When Was The Earliest T-Rex Found? The earliest Tyrannosaurus Rex sample to be unearthed was simply teeth and was located near Golden, Colorado in 1874 by A. Lakes. In the 1890’s J.B. Hatcher also collected postcranial elements in Eastern Wyoming. Such small discoveries of Tyrannosaurus Rex bone fragments and teeth went on until 1900 when Barnum Brown found a partial skeleton of a Tyrannosaurus Rex in eastern Wyoming. Brown later went on to find a second partial skeleton in Montana in 1902 and it was then that H.F. Osborn compared the two skeletal remains and determined that they were of the same species and revised records naming both samples Tyrannosaurus. How Many Specimens of Tyrannosaurus Rex’s Have Been Found? Over the years paleontologists have uncovered more than thirty specimens of Tyrannosaurus Rex allowing them to more accurately classify the Tyrannosaurus Rex in terms of mass and other forensic details. The largest specimen of Tyrannosaurus Rex nicknamed “Sue” was found in South Dakota in 1990. Sue was so named after the amateur paleontologist who discovered the remains, Sue Hendrickson. Sue’s remains were of great importance to paleontologists understanding of the Tyrannosaurus Rex since she was nearly 85% complete and could fill in many of the gaps that less complete Tyrannosaurus Rex remains had left. The fossil of Sue can now be located at the Field Museum of Natural History in Chicago after they paid a whopping 7.6 million dollars to obtain the remains. After studying Sue’s remains paleontologists determined that she had reached full growth by the age of 19 years old and died at age 28 which is a remarkable amount of time for any dinosaur to live. It is believed by some that Sue died from a bite to the back of the head; however, no data has ever been recorded to prove this theory and skull damage can be explained by post-mortem trauma. Another theory is that Sue died from eating parasite infected meat which caused her throat to swell thereby impeding her ability to eat. Further Tyrannosaurus Rex fossil discoveries have unearthed “Stan,” a 65% complete specimen found near Buffalo, South Dakota in 1987. Stan was somewhat remarkable in that he showed many broken and healed bones such as ribs, a broken neck which healed itself and a large hole to the back of his head which is reportedly the same size as a Tyrannosaurus Rex tooth. Following Stan’s discovery another discover in the summer of 2000 yielded five Tyrannosaurus Rex fossils near Montana. This discovery in itself was rather remarkable to find so many specimens in one area. In 2001 the skeleton of “Jane” was found and believed at the time to be a pygmy Tyrannosaurid; however, is thought by many paleontologists to be the most complete juvenile specimen ever found. Jane’s remains can now be found on display in the Burpee Museum of Natural History in Rockford, Illinois. Lastly on April 7, 2006 Montana State University announced via press release that they were in possession of the largest Tyrannosaurus Rex skull on record. How Large is the Largest T-Rex Skull? The skull in question was discovered in the 1960’s and had only just been reconstructed; the final result was a skull that measured 59” long. To compare the skull owned by Montana State University to Sue’s skull the skull owned by Montana State University measured 3.4 inches longer suggesting that Sue was not such a remarkably large specimen after all. Standing taller than a modern day giraffe and measuring in at half the length of a small blue whale the Tyrannosaurus Rex was certainly a force to be reckoned with. Regardless of whether this huge predator was a scavenger or a hunter the implication of this huge beast walking what is now North America was considerable. Even other Tyrannosaurus Rex were not safe from their own kind as is shown in the discovery of skulls that have large Tyrannosaurus Rex tooth marks in them, generally in the back of the skull. It is uncertain as to whether the Tyrannosaurus Rex was actually a cannibalistic creature or whether these bites were received during territory battles or protection of younger Tyrannosaurus Rex or hatchlings. Regardless of how they occurred the damage was certainly devastating, if not fatal. How Did Tyrannosaurus Rex Die? The Tyrannosaurus Rex saw the end of his days when the extinction event of the Cretaceous period hit. It is recent scientific belief that this event occurred as the result of a giant meteor hitting the Earth in the proximity of Mexico. As the meteor hit it threw up clouds of dust and noxious gasses which filled the air for years to follow. As a result there was very little vegetation available for the herbivores of the late cretaceous period and as a result there was very little food for the carnivores who survived the initial effects of the meteor strike. The devastation of the initial meteor strike caused a mass extinction of animal and plant life in a relatively short period of time. By the arrival of the Tertiary period there was no more dinosaur life to be found. Upon analysis of the geological rock of this particular period it is apparent that no dinosaurs passed through the mass extinction as dinosaur fossils are only found underneath the Cretaceous – Tertiary line of rock. While the end of the Tyrannosaurus Rex was not exactly fitting for the “king” of the dinosaurs, the fossils left behind are enough to remind us of the magnitude of this king during the Cretaceous period. Recent research conducted by Dr Karl Bates and his research team at Liverpool University has revealed just how devastating the jaws of the Tyrannosaurus Rex could be. According to his research the bite of this great beast was much greater than that of the great white shark – three times greater by his researcher’s estimations. What Does Dr. Bates Research Prove? Most dinosaur lovers know full well that the Tyrannosaurus Rex was a carnivore of gigantic proportions and certainly not one that offered a dainty bite to anything unlucky enough to be seen as prey. What most people don’t know however is just how deadly this bite was in terms of today’s animals. The great white shark has a bite that exerts approximately 1.8 tons or 3,600 pounds; recent data from Bates’ team suggests that the bite of the Tyrannosaurus Rex exerted 5.4 tons or 10,800 pounds. These figures are not considering the higher end of the scale which estimates a maximum bite force of over thirteen thousand pounds for a fully grown Tyrannosaurus Rex! How Did Dr. Bates Come Across His Data? Dr. Karl Bates is a musculoskeletal biologist and his interest in the bite force of the Tyrannosaurus Rex led him and his team to create computer models of the T-Rex’s jaws. The computer recreation utilized information available on the skulls of the theropod Allosaurus, a modern day alligator and a human. Using information that is available on the bite force from living creatures and using skull proportions and potential muscular structure from the Allosaurus and Tyrannosaurus, Bates and his team were able to approximate the power behind the massive jaws. The incredible crushing force applied by the Tyrannosaurus according to Bates data makes the bite of this incredible predator fifty times stronger than the crushing force applied to a prey item by a particularly large African lion. Amazingly, the data retrieved by Dr. Karl Bates and his team predicted a bite force of between 8,000 to 12,814 pounds on a single rear tooth. How does this compare to animals that walk Earth today? The simple fact is that it doesn’t. There is not an animal on the planet that even begins to measure up to the deadly potential of the Tyrannosaurus Rex. If there isn’t an animal today that measures up to the bite force of the T Rex, is there another dinosaur that was potentially more deadly in terms of bite force? There well could be; however, to date few bite force recreations have been done leaving little for the T Rex to be compared against. Why Did the Tyrannosaurus Have Such Significant Bite Force? The reason that most paleontologists give for the incredible bite force of the Tyrannosaurus Rex is the sheer size of the beast. This carnivorous predator fed on other dinosaurs and the larger the kill, the more sustenance the beast was able to provide both for itself and for its young. Without a very strong bite force, the fully grown Tyrannosaurus Rex would have been unable to bring down dinosaurs large enough to satisfy their hunger and allow them to survive. This theory is supported by the fact that as the Tyrannosaurus grew from a young hatchling to a fully grown adult, the bite force increased in order to allow them to bring down larger items of prey. Additionally it should be noted that as the T Rex grew it would become significantly slower and its forearms become proportionally smaller in comparison to its extremely large body. These factors mean that the T Rex would have relied much more upon its jaws to capture prey and the larger, slower prey items would be the best target for the slower moving adult Tyrannosaurus. Dr Karl Bates is somewhat hesitant to compare his data on the bite force of the Tyrannosaurus Rex to that of the great white shark. While the shark is certainly one of the most feared predators of today, the fact remains that it is an aquatic mammal which makes it a completely different organism in comparison to a terrestrial animal. So what does Bates prefer to compare this prehistoric giant to? Bates believes that the Nile crocodile is the closest living creature to the T Rex and as such their bite forces are more comparable. So how do the bite forces of these two creatures compare? The Nile crocodile with a bite force of approximately five thousand pounds doesn’t begin to measure up to the more than ten thousand pound bite of the Tyrannosaurus Rex. For those who are fascinated by the prehistoric carnivores like the Tyrannosaurus Rex, Dr Bates’ findings are particularly interesting because of what they prove and potentially disprove. 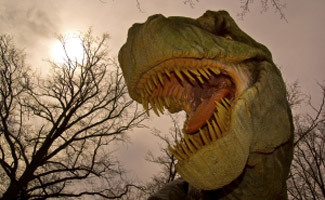 Since Dr. Bates computer recreation found that the bite force of the Tyrannosaurus Rex increased as the dinosaur grew, there is evidence that the feeding habits of this giant carnivore changed as it grew. Where juvenile T Rex would have been more athletic, it would have possessed much less jaw power to bring down prey and more than likely would have focused on hunting smaller food items. Prior to Bates’ research there were many who believed that the bite of the Tyrannosaurus was modest and this led the predator to a more scavenging based lifestyle rather than one based on predatory behavior. Bates’ research indicates that while these beliefs may hold true about juvenile T Rex, there is a much higher likelihood of the healthy adult Tyrannosaurus being an active predator that relied upon its bite force to bring down prey items the size of Triceratops with no trouble at all. So not only does Dr. Bates research point to the possibility of a change in feeding habits over the lifetime of the Tyrannosaurus Rex but it also points to the importance of the adaptation of bite force as carnivores evolved.